On Sundays, when everyone is just kinda veggin', Laura likes to have an easy meal ready for her lunch. 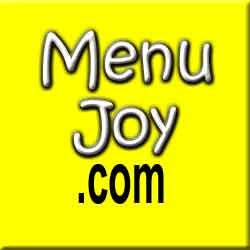 She'll often buy a pre-made salad or sandwich or sometimes a frozen meal. 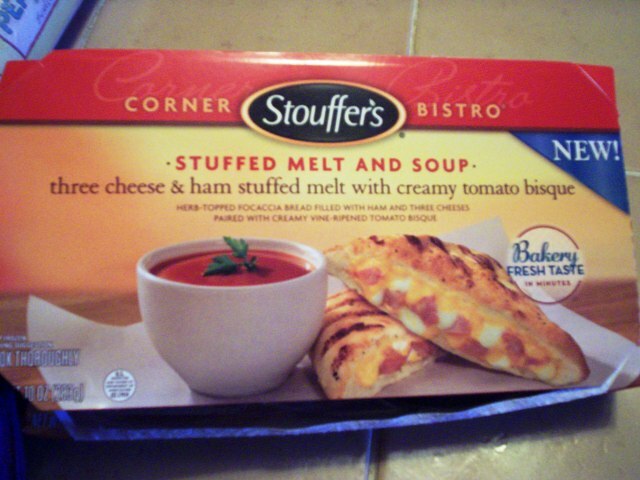 It was in the frozen section of our local Stop & Shop that she saw these new lunch combos from Stouffer's. They consisted of a small bowl of soup and a sandwich melt. What a perfect lunch! 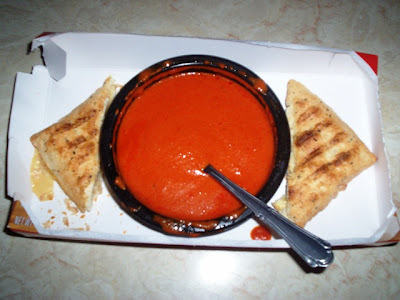 We saw three varieties: chicken bacon ranch melt with baked potato soup, steak and Swiss melt with broccoli cheddar soup, and three cheese and ham melt with creamy tomato bisque. Laura chose the latter. This little lunch contained 380 calories 160 of those from fat. It also had 990 mg. of sodium, 42 g. of carbs. and 15 g. of protein. If you're watching your sugar, it has 13 g. Laura said it was very easy to prepare and when she was done she found herself fully satisfied. But how did it taste? THE VERDICT: Unfortunately it tasted like a typical over-salted frozen meal. It wasn't bad, but you wouldn't confuse it with a fresh-made soup and sandwich. Laura preferred the melt to the soup, which she thought had a weird aftertaste. She found the sandwich soft and a bit more flavorful, but still having that "I've been in the freezer" taste. Would she buy it again? No, but everyone's taste is different so try it for yourself. I forget what we paid, but it was very reasonable.